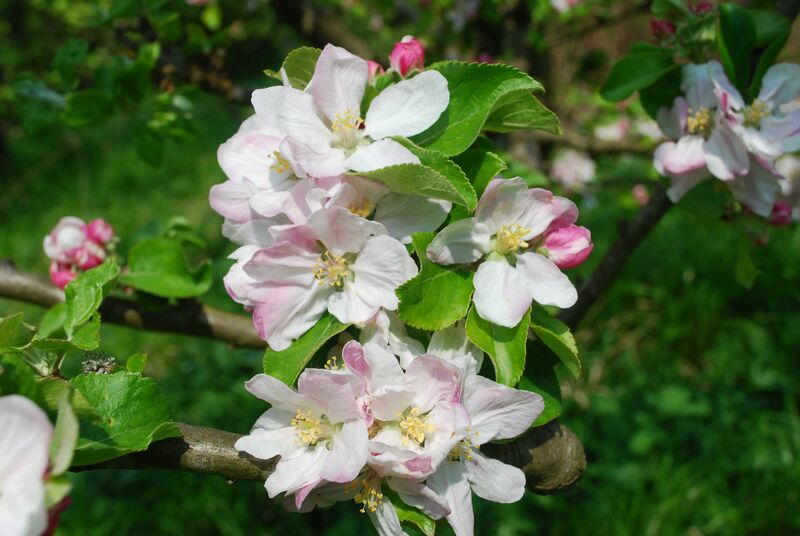 We will track the progress of fruit blossom during the coming weeks through its development in the National Fruit Collection at Brogdale, near Faversham, Kent. Our guide is Lorinda Jewsbury, who is going to give us information on a number of varieties in the Collection: dates when 10% of the buds are open, the tree is in full flower and when 90% of the petals have fallen. The varieties that Lorinda records are listed below with the dates observed so far. Updates will follow as we advance through blossom time. The year’s season held off from 2014’s early show of flowers, with the apricots, plums, cherries and pears opening their blooms a good 2-3 weeks later than last year. In mid-April we had a few unusually warm and sunny days, which really set the blooms in motion. One moment there was barely a pear tree in blossom, the next saw the orchard awash with white flowers. For the plums, a cluster of warm days gave a boost to the flowering times, with just 1-2 days between ‘10% of blossom open’ and ‘full flower’ for a number of varieties. It also gave a boost to the bees, butterflies and numerous other insects that appeared to be enjoying the sea of open flowers in the orchard. Hopefully they will have done a good job at pollinating the flowers for us and, weather permitting, a good crop will follow.